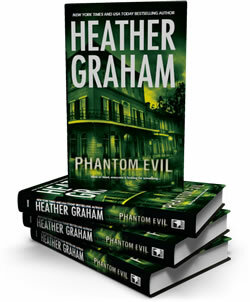 New York Times and USA Today bestselling author, Heather Graham has written over one hundred and fifty novels and novellas including category, suspense, historical romance, vampire fiction, time travel, occult, horror, and Christmas family fare. Her works have been published in approximately twenty-five languages, with over seventy-five million books in print. Her latest work, Phantom Evil will be released in April 2011. Phantom Evil, paranormal hardcover, carries on the paranormal series featuring Adam Harrison by introducing a team of characters with unique talents who are linked to him. This team—and the first of 4 ghost/paranormal books—are called the Krewe of Hunters. Jackson Crowe, part Cheyenne, heads the Krewe of Hunters in Phantom Evil. Teaming with Angela Hawkins, they investigate the death of a senator’s wife who fell to her death from balcony of a New Orleans mansion—once the site of a serial killer’s grisly work. Heart Of Evil (July), Sacred Evil (August) and The Evil Inside (September) will be released in mass market paperback.